One of the main complications about having a pool building and outdoor improvement business in the greater Houston area is rain. It rains a lot here at times, which is why we at Ultimate Pools penned a series of posts discussing the impact of wet weather on some of the major aspects of our business. These entries can be found on our blog, but if you want easy, one-click access, the link to our series on the effects of rain can be found here. 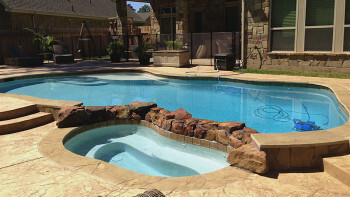 Here are excerpts of each of the five articles on the effects of rain on the Ultimate Pools process. These posts were written during the spring/summer of 2015. Part of living and working in Southeast Texas is sometimes dealing with rain — lots of rain. Before getting started on the second part of this series, here’s an article that reflects how strange the weather has been, as it was actually hotter in Alaska two weeks ago than it has been in the Greater Houston area in 2015. A lot of that has had to do with the overabundant rain, but luckily the forecast seems to be clearing up a bit. Forecasting, along with determining that the ground is dry enough for the big dig, has us to the next part, getting the pool ready to be surfaced. But although we have dug out the pool and made sure the soil is able to handle that, rain and moisture under the surface can still have an adverse affect if proper care isn’t taken. While the test holes that we dig to get soil composition and moisture help us determine when it’s appropriate to make the big dig in the pool, those holes typically go 3-4 feet deep. Since almost all of the pools we develop are deeper than that at their lowest point, sometimes we’ll hit some water and moisture on the big dig. Thankfully the sun has been out since we’ve last talked about the effects of rain on your Ultimate Pools pool. But anyone who has lived in Southeast Texas for any length of time knows that it can suddenly start raining for a week straight, and the long-term summer forecast still calls for more rain than normal. 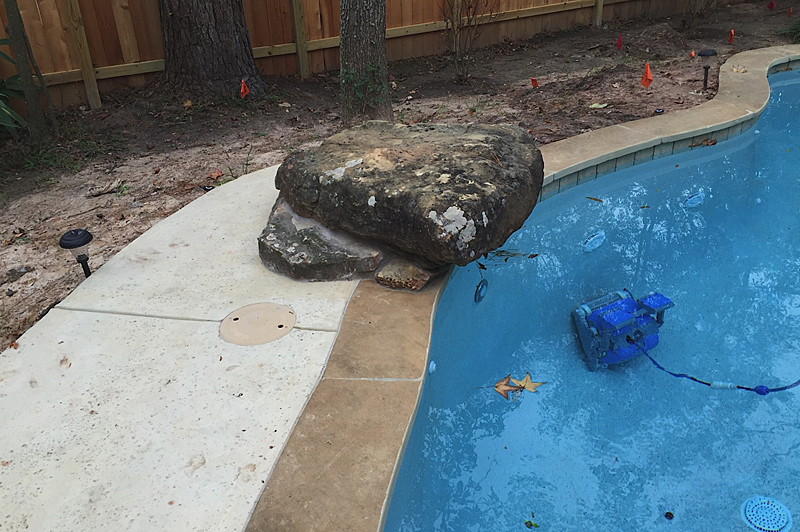 We’ve already talked about how rain and moisture affects on the initial dig and the surfacing of the pool, but Mother Nature’s effect on your pool doesn’t stop once the pool is dug, the plaster is surfaced and the pool is filled with water. A good, long shower can throw the pH of your pool off, cause debris to blow onto the surface or sink to the bottom of the pool, or throw off the chlorine levels of the water. When installing a pool, we offer some services to our customer for a fee that will help with the cleaning of the water and help balance its chemistry. Some of the main items we offer are the Intellichem System by Pentair and the robotic cleaners from Maytronics, including the Dolphin Supreme M400. Algae is something that can be beneficial in nature, as it serves as a generator of oxygen and also provides a necessary food source for fish and other underwater creatures. It can also turn into beautiful offshoots of kelp and other seaweeds in ocean waters. But when algae gets in your pool, it can be annoying at best and make your pool dangerous and completely unswimmable at worst. Unfortunately, Tropical Storm Bill has brought even more rain to this area. While it could have been worse, another side effect of all of the rain we’ve seen is an increase of algae in pools. 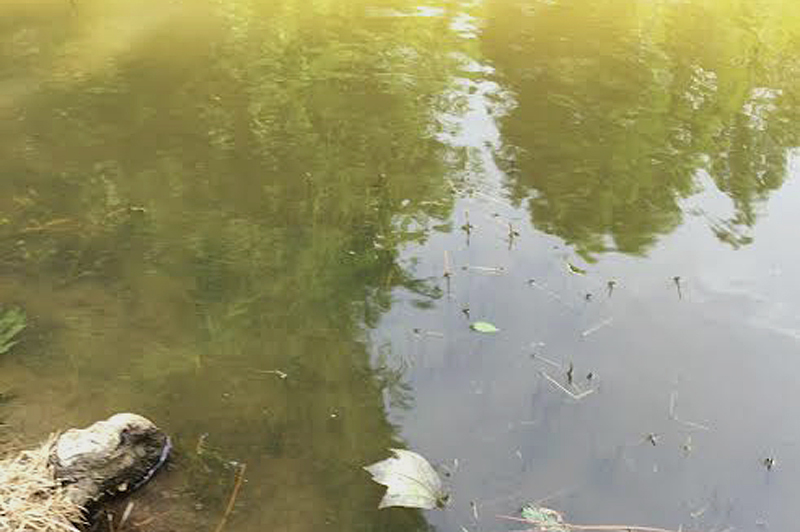 Algae can enter pools in a variety of ways, from being blown in by the rain and wind to germinating from phosphates that accumulate on the rock and plaster of the surface to blooming from bacteria and dirt that’s brought into the pool by humans. Algae can turn your crystal clear pool murky and green. Maybe not as green as your grass is right now after all of this rain, but green enough to bum you out. We’re finally to the end of our series about how rain affects the pool-building process, so hopefully the rain takes a hint and ends as well — at least for a little while. Maybe we can give our excess water to California or something, who knows? 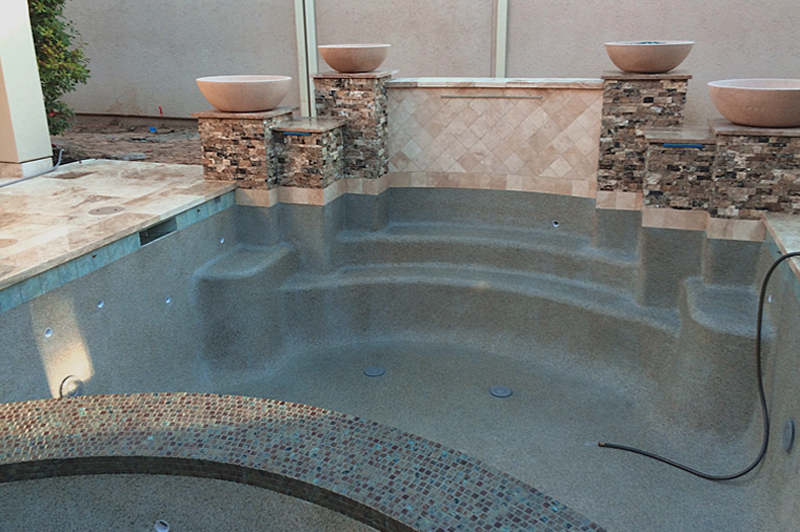 Either way, the last month or so has seen us tread very lightly when it comes to installing pools, and that care translates to items that we build to supplement your dream pool, namely decks and stone. Just like that luxurious pool that you enjoy swimming in, rain and moisture can have a big effect on how effectively your deck and stone is installed. 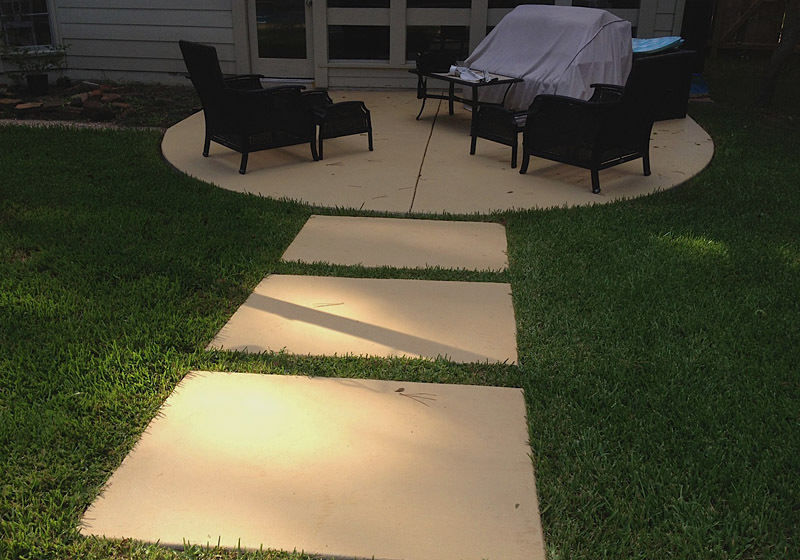 Just like with your pool, we want to build your deck and lay your stone correctly the first time. We’d rather take some extra time to wait for the rain to stop and the ground to become drier and more secure at the beginning than to deal with the problems that come from rushing a job on saturated ground later. 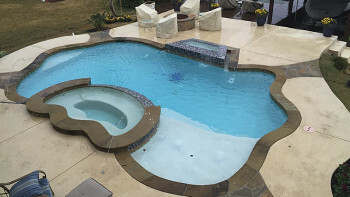 Ultimate Pools has been a leader in pool building and outdoor improvements in Magnolia, The Woodlands and Southeast Texas since 1991, specializing as a pool builder since 1999. 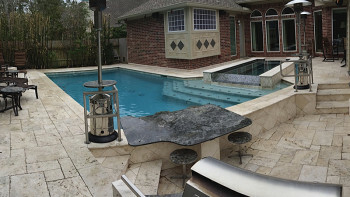 From pools, waterfalls, hot tubs, decks, outdoor kitchens and outdoor improvements, Ultimate Pools will provide the highest of quality and customer service to you. Surf our website, send us an email, give us a call at (936) 321-9632, or visit our offices at 5170 FM 1488, Magnolia, TX 77354 today! Where Attention to Detail Makes a Difference! At Ultimate Pools we design and build customized, one-of-a-kind pools for residents of Montgomery County and North Harris County! 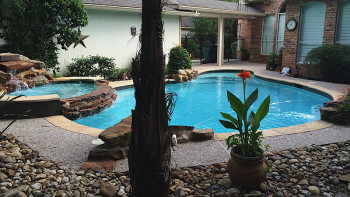 Whether you live in Magnolia, The Woodlands, Tomball, Montgomery, Conroe, Spring, or elsewhere in the northern Greater Houston area, Ultimate Pools is at your service, providing you the latest in home swimming pool design and technology. The story of Ultimate Pools didn’t actually start with the glistening, stylish swimming pools that we build today. Instead, our story began with A Total Coverage, which was founded by Bryan Stuart and Deborah Stuart in November 1991 and specialized in lawn sprinkler systems and improvements.